What else could a dressage rider or breeder wish for? Her pedigree speaks for itself: Champion stallion, world champions and Grand Prix winner over several generations, including top names like Donnerhall, Florestan, Rubinstein. Beautiful movements, easy-going temperament and excellent character make this mare a joy to work with. 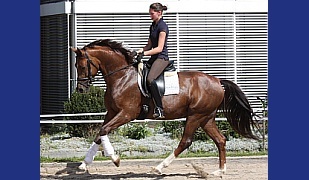 She is a sweet, willing and trusting youngster with a great potential for a successful dressage and breeding career. Mare has made 2015 a very good mare test. Here she shows a lot of rideability and very good activity in her legs behind. Easy in the hand and clear in the head !! Mare was by the mare test first 8 weeks under the saddle because she has had a stunning premium foal bevor. Stallion candidate ! But this thim was enought that she can be shown to the mare test . 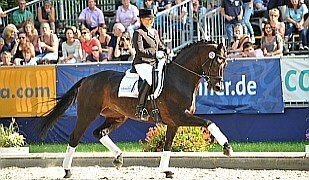 Performance tested in Oldenburg with premium status. Now first level ready and winner in her first competition show 2016 scored with 8,2. 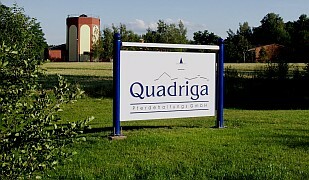 Second dressage level has already started. Video shows her after 3 weeks training under the rider and without hoofshoes. 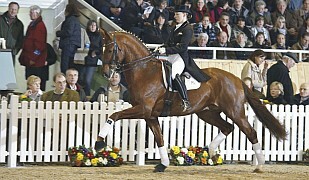 Mare with an incredible pedigree that includes the top dressage producer Rohdiamant/Lisa Wilcox. Elektia dam line is one of the most important world wide. Mare is in training for mare test in may. Full sister, dam , grand and ur grand dam are Elitemares. Grand dam is full sister to starshire Rohdiamant/Royal Diamond. 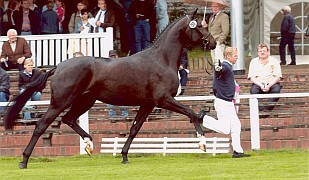 Her sire, Dr. Jackson, is in the top 1 % of the German breeding list for the 11 years. 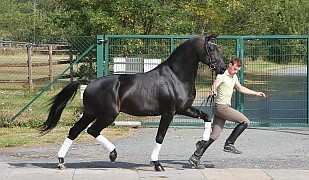 He has gained a reputation for producing top contenders for the international dressage scene (for example, the Grand Prix gelding “Douglas”) and is known for passing on his excellent rideability to his offspring.grandsire, Fürst Heinrich, was winner of the Bundeschampionship and world champion of the 6-year old dressage horses. And, of course, we have Rubinstein at the bottom of her pedigree, one of the signature stallions of German horse breeding!